1. I was one of the judges for the final round of the Cybils Awards for Fiction Picture books last January & February. Despite the nail-biting moments of struggling to decide on a winner, the process of discussing picture books with others who love them as much as I do was great and I learned a lot. 2. I participated in the 12 x 12 Picture Book Challenge again (writing 12 picture books in 12 months). I didn't write any more picture books than last year but it was a good way to stay motivated. 3. I worked on revisions to one of my middle grade novels and my agent sent it out on submission before the end of 2016. 4. I revised several picture book manuscripts. 5. I attended a few local SCBWI meetings and I also participated in a book club (adult literature) at my local library. So much fun to meet more people who also love writing and books! 6. I read over 150 children's and YA books in my personal reading challenge. Some years it's easy to find successes, but this year I was a little afraid there wouldn't be any. I experienced several life-changing events in my personal life that made it hard to focus on writing or reading. But no matter how small, celebrating successes is important. I urge you to give it a try. Head into 2017 on a positive note! What are you most proud of this year? I hope you feel good about your successes! I've never seen a picture book that talks about this idea of classification before. A simple but unique story. 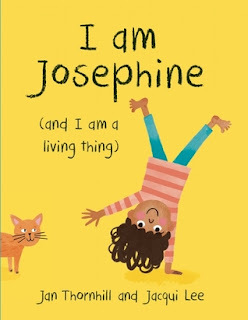 I am Josephine (and I am a living thing), was written by Jan Thornhill and illustrated by Jacqui Lee, was published in 2016 by OwlKids. I really loved the concept of this book, and the simple kid-friendly text and illustrations. The repetitive style creates a rhythm and expectation for the reader. I also liked the places where readers are invited to find or count examples of each concept. The illustrations are cartoon-like and fun, but also make it easy to identify each animal or being. I haven’t seen a book that explains these categories to young children before and I really love it. I think it could provoke a lot of discussion. What is a living thing? I liked the lists at the end to explain the concepts. Provide pictures of different kinds of living things for children and have them decide which group(s) they belong to. Draw a picture of yourself and write your answer to the question on the last page of the book: What makes you different from other human beings? Think about how you fit into other groups (e.g., immediate family group, relative group, friend group, class group, school group ) etc. and write an “I am ______ story of your own. Learning from Picture Books – HEY, THAT’S MY MONSTER! I especially loved exploring the illustrations in this book. 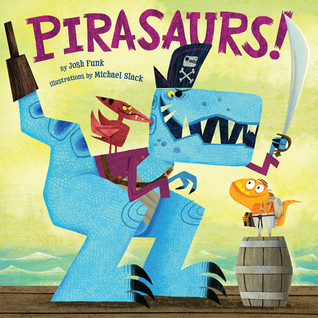 I haven’t read the first book by this author and illustrator duo, I NEED MY MONSTER, but now I want to! climbing out of bed to play. She obviously needs a monster to help her get to sleep, but not HIS monster! Will Ethan lose Gabe forever? The perfect balance of giggles and shivers will keep you under your covers, and you'll soon be sleeping soundly. 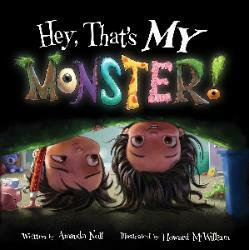 Hey, That’s My Monster was written by Amanda Noll and illustrated by Howard McWilliam. It was published in 2016 by Flashlight Press. I enjoyed the fun concept of turning around the typical monster-under-the-bed story by including a problem that the narrator’s sister isn’t afraid of monsters. I liked the inventive monsters with their different ways of attempting to get Emma to sleep. The rich illustrations in this book are full of fun details. They really come to life on the page! After enjoying the fun of a read aloud with this story, it would be useful for discussing a problem and solution story framework. The vivid illustrations also make it a good choice for doing a picture walk through, and talking about the pictures before reading the text. What is your favourite illustration in this story? Explain why. If you had a monster under your bed, what would it look like? Draw a picture and write about your monster’s special skills. What if Emma didn't have a monster? Brainstorm a list of other ways the narrator could try to get Emma to fall asleep! I discovered this book in the summer and really enjoyed it. I like reading about the details of life from different perspectives and time periods. This would be a really good book to share with students to help them learn about another culture. Nineteenth-century American pioneer life was introduced to thousands of young readers by Laura Ingalls Wilder's beloved Little House books. With The Birchbark House, award-winning author Louise Erdrich's first novel for young readers, this same slice of history is seen through the eyes of the spirited, 7-year-old Ojibwa girl Omakayas, or Little Frog, so named because her first step was a hop. The sole survivor of a smallpox epidemic on Spirit Island, Omakayas, then only a baby girl, was rescued by a fearless woman named Tallow and welcomed into an Ojibwa family on Lake Superior's Madeline Island, the Island of the Golden-Breasted Woodpecker. We follow Omakayas and her adopted family through a cycle of four seasons in 1847, including the winter, when a historically documented outbreak of smallpox overtook the island. 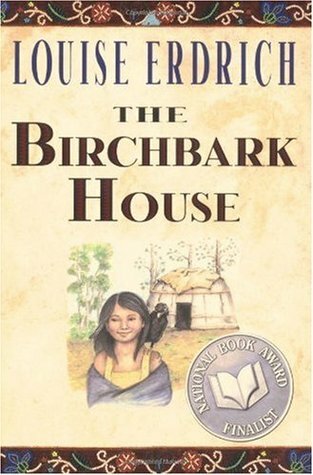 The Birchbark House was written by Louise Erdrich and published by Hyperion in 1999. I really enjoyed this story – especially all the details of the chores Omakayas did, and her relationship with her family and the mischievous crow, Andeg. I learned more about the Ojibwa culture and thought more deeply about what they may have experienced. This story was really a survival story – one where the main character faced a variety of hardships, including sickness and death. It kept me hooked until the end. I also liked the main character’s special connectedness to animals and how she learned from her family. Since I grew up on the shores of Lake Superior, I was particularly interested in the setting. The author used lots of specific detail in her descriptions. Even though this story did not follow a traditional plot, the family conflicts and hardships, as well the development of the character Omakayas kept me interested and wanting to finish the story. The way the author sprinkled in traditional language added to the authenticity of the story (there is a glossary at the back). 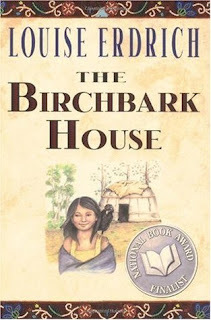 Louise Erdrich has written several other books in the Birchbark House series. Here’s a discussion of the importance of names for the Ojibwa girl, Omakayas, in The Birchbark House. Learning from Picture Books – QUIT CALLING ME A MONSTER! Since Hallowe'en is approaching, I thought this was a fun choice for a "monster" book that isn't too scary. This will make kids laugh. 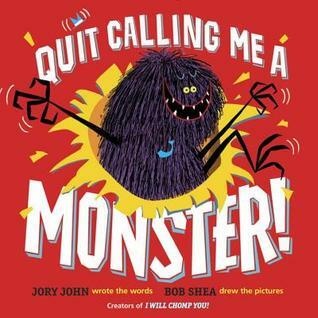 Quit Calling Me a Monster was written by Jory John and illustrated by Bob Shea. It was published in 2016 by Random House Children’s Books. I loved the voice in this story because it really allows the monster’s personality to shine through. It’s a great example of a story written in dialogue—or a monologue, really, up until the end. There’s lots of repetition in the structure of this story (a whole section where sentences start with “and”). Bob Shea’s colourful illustrations keep the monster from being too scary. The “glow in the dark” monster smile allows us to know where the monster is even when it’s in the dark under the bed – a nice design. Love the expressions on the monster's face! The monster tries really hard to convince the reader that he’s not a monster…until it becomes really obvious that he is. It’s a good book for starting a discussion about how someone feels about what they are called. This would also be a fun book to use as a model for writing with older kids. I'd use it to talk about taking another perspective, and maybe brainstorm ideas about the different perspectives of the child, monster and parent. Talk about different words to describe the way the child, parent and monster feel about the monster. Draw a picture of an imaginary monster in any place you can think of (e.g., the grocery story, the swimming pool, the library). Write a speech bubble to show what your monster is really thinking. And don't forget to name for your monster! I really love fractured fairy-tales and this one was a lot of fun! I especially liked the safari theme and the confidence and creativity of Little Red. Little Red sets off to visit her auntie who is poorly. She walks under the giraffes, over the sleepy crocodiles, past the enormous elephants and the chattering monkeys. Then a Very Hungry Lion approaches Little Red, wanting to gobble her up. But despite all the cunning plans by Lion, Little Red outsmarts him and soon has him saying sorry and eating doughnuts instead. Little Red and the Very Hungry Lion was written and illustrated by Alex T. Smith. It was published in 2016 by Scholastic Press. I liked the humorous tone of the story. It drew me in right away and set up an expectation that the Lion might be tricked. 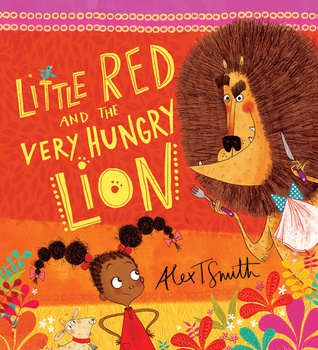 I loved Little Red’s personality, and how she set out to get back at the Lion – her ideas were a lot of fun and offered lots of possibilities for the illustrations. The illustrations were interesting from a design perspective, since some of the pages were divided in unexpected ways. I liked the bright, fun colours that fit the safari theme, and details like the antics of Little Red’s tiny goat. A good story for a read aloud. I really enjoyed all the animals Little Red met along her way, which could be paired with non-fiction books for additional learning. I also really liked the plan the lion made – this could be a model for students to use when making their own plan. What I liked most of all were the fun story twists and the boldness of Red's character. It would be interesting to compare her actions to the Red Riding Hood in a more traditional version of the story. I wondered, though, if the idea of being eaten might be a little scary for preschoolers. With a partner, make some props and act out the story! How do you think each character feels? Read a traditional version of Little Red Riding Hood. Compare the stories and find similarities and differences. Find out about one of the animals Little Red meets on her way to Auntie’s house. Make a funny poster to show how it might escape the Lion. Look through the book and find details that the author/illustrator used to show that the story takes place in Africa. This book has been on my reading wish list for a long time and I’m so glad I finally got to read it (as an e-book from the Toronto Public Library). But a warning if you haven’t read it – you may need a box of tissues by your side for this emotional story. Carley uses humor and street smarts to keep her emotional walls high and thick. But the day she becomes a foster child and moves in with the Murphys, she's blindsided. This loving, bustling family shows Carley the stable family life she never thought existed and she feels like an alien in their cookie-cutter-perfect household. Despite her resistance, the Murphys eventually show her what it feels like to belong, until her mother wants her back and Carley has to decide where and how to live. She's not really a Murphy, but the gifts they've given her have opened up a new future. One for the Murphys was written by Lynda Mullaly Hunt and published by Nancy Paulsen Books, an imprint of Penguin Group in 2012. I really enjoyed this story – it was sad and funny and had many interesting moments. I connected with the main character, Carley, right from the beginning. I was rooting for her to change and for her to allow herself to be loved. I really liked that the ending was resolved, but not in a way that ties everything up perfectly (a little bit uncertain and messy, the same way that life is messy). I also really liked Carley’s relationships with her new friend Toni, and all the Murphy kids. I think this story portrayed a realistic situation and characters, without shying away from heartbreaking emotions. It captured my attention from the moment I began reading, and I read all the way through because I couldn’t put it down. I felt that the author chose her words quite carefully, not overloading the text with too much description or metaphor, but creating strong images so that I could picture what and where things were happening. 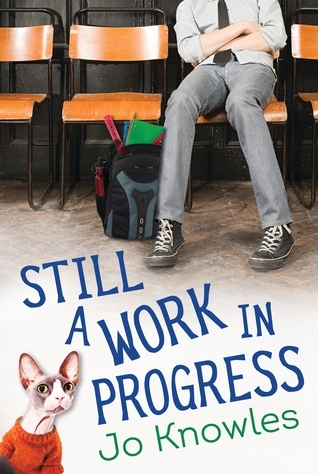 This novel is a great example of a character-driven contemporary middle grade. There were a lot of characters, but each one had a distinct personality. I really admired how the author gradually showed us the changes in Carley and her developing inner strength. Lynda Mullaly-Hunt is the author of Fish in a Tree, another book I really enjoyed! (See my review here.) One for the Murphys has won several awards and distinctions. I really love the slogan from the teacher guide: Be someone’s hero. No cape required. It’s an awesome motto I may just put up over my computer. It would be a good one to discuss in a classroom, especially about different ways to be someone’s hero (contrasting real life with superheroes) and the ordinary people that kids might admire or think of as a hero. 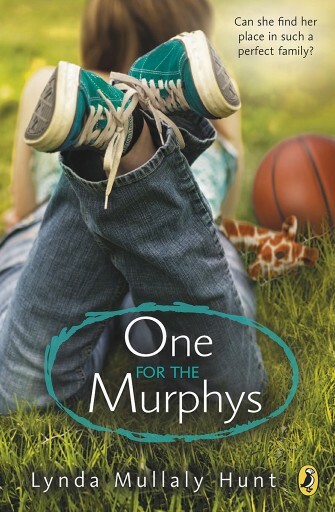 Check out the book trailer for One for the Murphys. This is a fun book for dog lovers! Older primary students will definitely appreciate the humor. On a rainy day, Frank’s parents take him to the shelter to get a new dog. That’s how Frank finds Lucky, and from that moment on, they’re inseparable. As Frank and Lucky venture out into the world around them, they discover they both have a lot to learn. Exploring their neighborhood teaches them about biology: Lucky learns all about squirrels, deer, and—unfortunately for Frank—skunks. Sharing a bed teaches them about fractions—what happens when one dog takes up three-quarters of the bed, or even the whole thing? They even learn different languages: Frank makes a friend who speaks Spanish and Lucky tries to learn Duck! Who knew you could learn so much without ever setting foot inside a classroom? 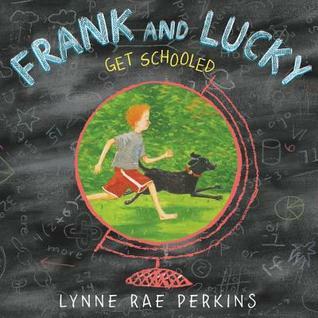 Frank and Lucky Get Schooled was written and illustrated by Lynne Rae Perkins, and published in 2016 by Greenwillow Books, an imprint of HarperCollins. This was a different take on the typical dog story, showing what dogs and people learn from each other with lots of humorous lines and speech bubbles to show show the imagined perspective of the dog. It was fun the way the book considered different school subjects such as math, science, history, arts, etc. so I really liked the concept of this book. I enjoyed all the detail in the illustrations, and how everyday things are used to show concepts like fractions, etc. As a teacher, I really liked the way this book shows how learning is part of everyday life—even for dogs! It also shows how different areas of learning are connected (useful for teaching purposes but mostly just fun!) and how you can learn different things, depending on your perspective. This book is also great for modeling inquiry, since it is full of questions that come up about real world objects and occurrences. I think 2nd and 3rd graders would especially like this book. My one tiny quibble is that the first line is hard to understand if you’re not familiar with the expression, and that may put some kids off reading it. But it would be an excellent read aloud, especially for early in the school year. I think it’s also a book that kids will love to explore and revisit, because of all the details in the text and illustrations. Pick your favorite school subject and your favorite animal, and make a comic (or write a page) showing the different things you and your animals might learn in that subject. Think of an everyday experience, such as what happens when you get home from school, a birthday party, a trip to the park, and write down three different questions about it. Share your wonderings with a partner! Draw a picture of your pet (or a pet you’d like to have). Which school subject do you think they will enjoy the most? Explain why. 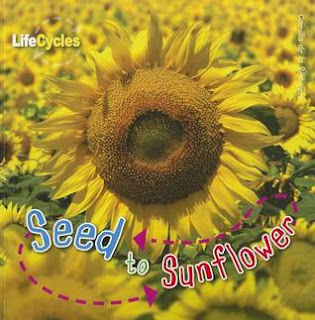 I was thrilled to discover this non-fiction book because the sunflowers my class planted last year have grown to be so big over the summer! It’s a perfect selection for a classroom science book shelf! How do sunflowers begin? What do sunflowers need to grow? When do the flowers open? Packed with fascinating facts about life cycles, amazing photographs of every stage, and labelled diagrams to explain growth and development. Discover the amazing stages of different life cycles and learn all about your favorite species with this stunning series. From plants and birds to garden animals, readers will soon learn how different species are born, grow up, and reproduce. Each book has amazing photographs, easy-to-understand text, and discussion points for further learning. Seed to Sunflower was written by Camilla de la Bedoyere, originally published in 2009 by QED in the UK and in 2016 by QEB Publishing in the USA. A review copy of this book was provided by the publisher. I liked the way size comparisons are relative to something children are very familiar with (e.g., “A seed is no bigger than your fingernail…”). Each sentence is short and clear, with one piece of information. Words are explained in the text and in the glossary. 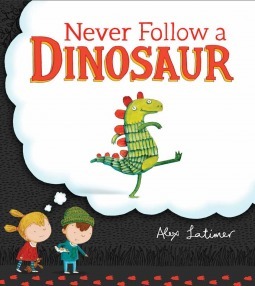 This is a great example of a non-fiction book that is accessible to young readers. Even if they can’t read the text, the photographs will capture their attention. I especially love the big colour photographs, which show close ups and details of plants and seedlings. This book is full of information, but not so much that it will overwhelm students. Choosing a sunflower as an example for how seeds grow is perfect, since sunflowers are easy for students to grow themselves. Act out the life cycle of a sunflower. Can you make a sunflower dance? Plant your own sunflower seed and watch it develop! See how tall or how fast it grows. Get arty and create a design using sunflower seeds. Or look closely at real sunflowers and make a drawing or painting. More activities and ideas can be found on the last page of the book. This book is part of a life cycle series all written by the same author, with similar style and photographs. Other titles include: Caterpillar to Butterfly, Egg to Bee, Tadpole to Frog, Egg to Chicken, Acorn to Oak Tree. I remember where I was on September 11, 2001 and how the shock and horror of the event rocked my life, even though I was hundreds of miles away. When I read this book, I appreciated how the author tried to show the impact of this event on everyday life even for those not immediately connected with it. Nine, Ten: A September 11 Story was written by Nora Raleigh Baskin and published by Atheneum Books for Young Readers in 2016. At first, I didn’t know what to expect from this story. The separateness of the main characters’ stories surprised me, but once I settled into the rhythm of the book, I was interested in each one of them and what might happen. I really loved how these characters were so different, yet each one was affected by the events in their own way. I liked the way this story didn’t focus on the raw and gritty details of 9/11, but instead focused on the impact to these very different character’s lives. Because of the many different issues and challenges for these characters (e.g., bullying, loss, making friends, individual differences), this would make a good book for a discussion group or read aloud. I was really interested in the way this book was structured from four different perspectives, and I especially liked the small connections between the four main characters at the beginning of the story—and then the way it circled around, connecting them again. It’s a good mentor text for anyone writing a story told from several different points of view. 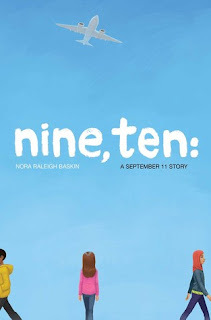 Nora Raleigh Baskin is the author of several middle grade novels, including Ruby on the Outside, The Truth About My Bat Mitzvah, Anything But Typical, and The Summer Before Boys. This book has a curriculum guide with activities and discussion questions.